OK, we got our software… now we need Blender plugins. The MMD_Tools plugin will let you load mesh/vertices/polygons models but without any bones or anything like that. I recommend it only for exporting mesh; never had an export with bones with it, not sure how that will work! … to show you an example of how easy it is to export stuff. I recommend going to windows explorer and copy and paste the place where you wanna save so its easier to navigate. 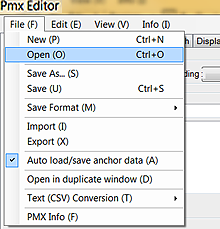 Open PMXEditor and open the pmx file you saved. You have your file… though you do need to make the settings correct to make the shadows work, and stuff. Don’t forget to add toon files to make the shadows work. … and if the rules don’t match, MMD will crash! … and there are a few more rules… but I only know these from my experience. OK, since you have added a bone it will automatically be rigged, too, so don’t worry about rigging everything to one bone. Scale the thing up because it exports it at quite a small size. If you like the size, sure, but for me all the stuff I export is really small… so, you click move at the top of pmx view or f4 if you are a shortcut fan like me. Now select everything and scale it up while holding scale in object manipulation. 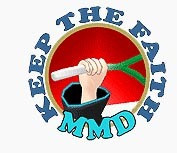 SAVE and open it up in MMD… it should work now! i have another problem here im using blender and i tried to rename the bones i already have in English to Japanese but don’t know how so anyone got any ideas? That’s why I said that you can not do it all without finishing it in PMXE. 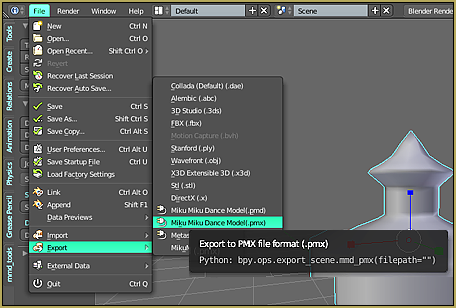 Separate Japanese and English name fields are a feature of PMX model format, Blender is simply not aware of them. It is a powerful editor and a great help, no doubt about that… but using MMD_Tools does not make it an MMD tool, so to speak. Not the native one. You absolutely should not translate Japanese bone names in Blender. Japanese bone names, at least the key ones, are required by MMD for the model to work normally. This means that without these names, most motion data will not work with the model. English translated bone names are merely labels and in themselves have no technical functionality. These fields can in fact be in any language or even glibberish, and the model will still work so long as the required Japanese bone name set remains intact. If you add a new bone for something that is not in the mandatory bone set, the name can be in English and the model will still work. 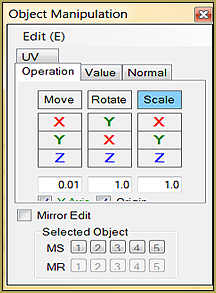 If you use MMD Tools plugin, you’ll find that it adds new categories (custom data) to your bone tab. In these fields, you can specify a Japanese and English name for export. If you’re not interested in export, but are animating solely in Blender and want to import animation data for .vmd files, just rename your Blender bones (and vertex groups, but IIRC Blender does that for you) to the appropriate Japanese names. i have a model here that i rigged and use for mmd but when i add the motion to this model the only thing that actually moves is the master bone. so im wondering if any of you people can somehow fix this problem that i have. Are you sure that your model is rigged AND weighted properly? yes it is. also im doing this in mmd tools in blender but when i play the motion the bones don’t follow it olny the root bone does. If you move a random bone manually in MMD, does the body react properly? Do all your bones have correct Japanese names? Well, that’s your answer, then. Both pose and motion data (just like absolutely everything else in MMD) refer to models’ bones by their Japanese names that must match the standard scheme. so the motion or poses just wont work unless i rename them to japanese? like 武器,頭 and 指? Do you have a worksheet on how make sure it’s done right? More precisely, unless you fill Japanese name fields with those names, yes (English fields are only for convenience, and many Japanese model-makers just leave them unattended). Off the top of my head, I can’t think of a way to *easily* rename all bones from arbitrary names like bone.001. Depending on how well you know your model, it might be quicker to use one of two methods: open two PMXE windows side-by-side, one with your model and another with a well-developed model that already has all bones named, and find an equivalent for each (invisible “destination” bones you can skip for speed). Or, you can select all bones in the main window’s Bones panel’s list, press Ctrl-C, and paste the result into a simple text editor, like Notepad++ (a regular Windows Notepad may garble Japanese characters to you). Then fill Japanese fields in the text, and copy-paste bones’ descriptions back into PMXE. The Excel table also may or may not be of help to you. This? >マスターボーン.001 in the Japanese field to each name of each bone like that? And btw since im doing this in blender using mmd tools its not necessarily recommended to use pmxe since i have all those features in blender it’s just i have to operate differently so notepad and excel will be useless if have to rely on that first. The masterbone should be called 全ての親, the centerbone should be センター, no “.001” or some other nonsense. 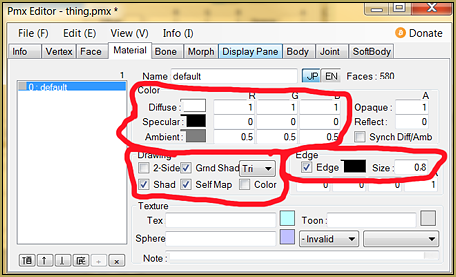 *Each* bone must be named *exactly* as their equivalents are called in other MMD models, that’s why I offered to open two corresponding models side by side in PMXE, to get proper names that should be there. If you can name them properly using mmdtools, godspeed to you. You’re free to do in Blender anything it is capable of, just don’t expect the result to be ready out of the box for using in MMD without final polishing. That’s fine by me if renameing them equivalently does solve my problem but somehow still becomes incomplete in mmd i will surely let you know otherwise. Btw do you know anyone else here that has better experience in blender besides mae? Well, there’s also bandages, he works in Blender a lot. do i need to add a color from the pmx editor, or can i just add a color to an object straight from blender? While it’s possible to specify the colors you want from Blender, that’s a situation where it’s probably better to do it in PMXE, because it’s actually easier, and Blender won’t give you a proper MMD preview anyways– what a color looks like in Blender won’t be what it looks like in MMD. So bandages do you know how to make a model in blender using mmd tools without pmx editor? ALL models made in ANY 3D program that is intended for use with MMD MUST be processed using the PMD or PMX Editor, with the possible exception of Metasequoia (Japanese version with the relevant plugins). MMD models have their own set of technical requirements and particular ways of doing things, so this is why these extra steps are required. Make a cube or whatever. Shift-a add armature->New MMD model. Parent your cube to your new armature. Export to .pmx . You don’t need to do cleanup in PMXE. Hi… I have a model that I created using the makehuman plugins for blender. – when I try to export the pmx file using Meshio plugin the pmx file is successfully generated, but when I import to PMXE, only a portion of the object appears, in this case, only body parts are available, while the other parts are missing. Look for error messages on the console. If you don’t get any error messages, consider making a bug report for either. There are a number of ways that a model can be messed up, and sometimes when the plugins don’t know what to do with something, they just give up. Consider breaking the model down into parts. Does the hair export properly? Do the pants? Then those aren’t the problem, something else is. Export mesh + MB only, export armature only, export armature + physics only to rule out sources of your problem. https://www.deviantart.com/hogarth-mmd has some experience with exporting make-human models to MMD and might share likely sources of trouble. I’m not familiar with that add-on myself. If you want to send a file to MMD, it’ll probably reach me and I’d take a closer look at it. I exported the blender model to PMX, added bones and shadow but MMD crashes every time I try to open it. What am I doing wrong? 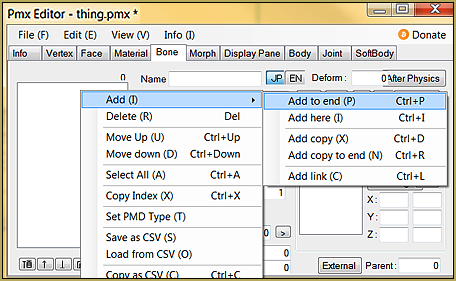 Try using file->PMX info in PMXE and copy/pasting the text into a translation service. It should give you a list of issues with your model, good places to look to fix things. If you fix all issues listed, please feel free to send us a copy of the model and we will be happy to take a look at it. Also when it come to mmd tools every time i import a model to blender the whole app shut off, can anyone give me a bucket of ideas? I don’t use Pymeshio, but you might want to look up the author’s Github page and create an issue there if you have a problem. I use mmd_tools. 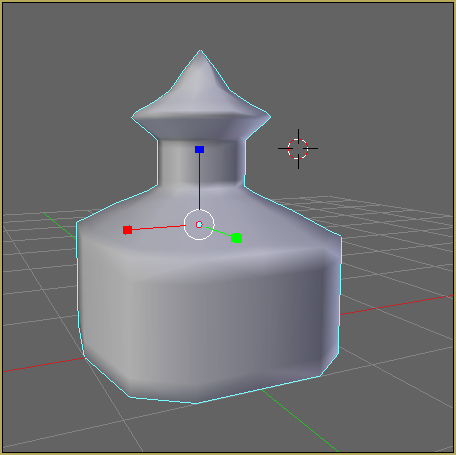 I wouldn’t recommend the link on this page, as it links to an older version; there is a newer fork with a lot of improvements at https://github.com/powroupi/blender_mmd_tools . So what I’d recommend doing is uninstalling and deleting Pymeshio and your version of mmd_tools and installing the new version from that link. Powroupi’s mmd_tools fork is very stable, very useful, although there are still a few remaining issues with it. So… does anyone know how to solve this problem when ti comes to Exporting and importing pmd and pmx models? It WOULD be good if you included how to install MMD Tools and Meshio to Blender. I have NO IDEA how! No idea about Meshio. Don’t use it. But MMD Tools has installation instructions on its wiki at https://github.com/powroupi/blender_mmd_tools/wiki/Documentation. Generally a procedure to install Blender plugins is: download it, launch Blender, select “File->User Preferences->Addons”, and click “Install from File”. Find the .zip you downloaded and install it. After that, find its titles in the list of installed plugins and enable it. Wait some time for it to activate, and you’re good to go. Thanks. I tried it, but it doesn’t seem to be exporting for some reason. I got a .rip file from an exe game, used Noesis to turn it into an OBJ file and then used Blender to make it a PMD file and it doesn’t even show up in the folder! And I tried to make it a .x file and that doesn’t show up in MMD! I don’t know what I’m doing from. FWIW, I believe Blender has a native export to .x file (although it may require enabling a built-in addon, I can’t remember.) Obj files don’t have much in the way of extra info like weights, just vertices, UVs, and textures, so an .x file is fine for that. FWIW, I’ve had problems with the PMXE import from .obj feature myself. I suspect it’s not implemented very well. As far as exporting to .pmd, it sounds like it’s not getting exported whatsoever. The usual reason for this is that MMD Tools doesn’t know what it’s supposed to be exporting (but you should check the Blender console for error messages too.) You’ll need to join a mesh to an MMD model in Blender for it to get exported. You can do this via the attach meshes button or by parenting the mesh to the armature of an existing MMD model. For more information, check out the wiki, which I linked above. Hi there! 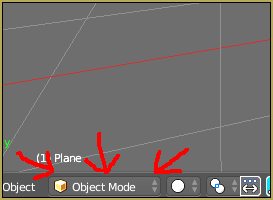 When I try to export the object using MMD tools in Blender, sometimes it doesn’t save the file at all. 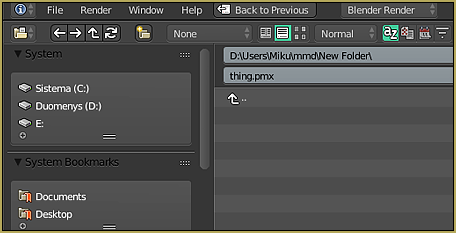 Other times, it saves it but nothing shows up in the PMX editor. Please help :( This is driving me insane. It depends on what version of MMD tools you’re using, but there are a number of things that could be happening. The first thing that I’d do is recommend the updated version of MMD Tools at https://github.com/powroupi/blender_mmd_tools which will lead to this problem less frequently. Once you do that, take care with your objects, how you join and separate them. If you are trying to combine multiple models, instead of just editing a single model in Blender, save and export often, just to make sure you haven’t done anything that will break it. I recommend you import everything you’re going to need into a single PMX to take into Blender, and then only use the objects in that file– not even any primitives! That’s the safest bet, at least. Um… Excuse me Gloria. Do you know how to post in this? Because idk how you post. If you mean how to post a comment, you just did. It didn’t show immediately, because your email had to pass validation, but it’s all there, dont worry. Is you’re interested in posting an article here, though, you should contact Reggie about registering you as a contributor. https://github.com/powroupi/blender_mmd_tools/wiki/Documentation has installation instructions. It is for a later branch of MMD tools (that I’d highly recommend), but the installation instructions also work for the older branch linked in GTA’s article.